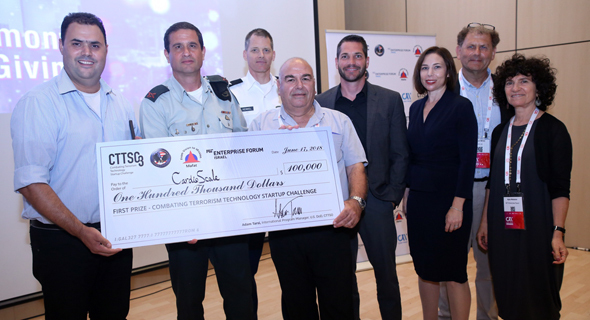 The winners of a counter-terrorism technology competition backed by the Israeli and U.S. governments were announced today. CardioScale Ltd. won first place and $100,000 prize with a device that promises to help monitor the vitals of survivors of terrorist attacks and mass casualty events. Second place, and a $10,000 check, went to Colugo Systems Ltd., which is developing a hybrid drone that combines the features of a quadrotor and a fixed-wing unmanned aerial vehicle. Both companies are early-stage startups based in Israel. The competition, known as the Combating Terrorism Technology Startup Challenge, took place in Tel Aviv, and is sponsored by the U.S. Department of Defense, Israel’s Ministry of Defense and the Israeli chapter of MIT Enterprise Forum, a nonprofit affiliated with the eponymous university, that promotes tech innovation. CardioScale and Colugo Systems competed in a field of 130 startups from around the world.